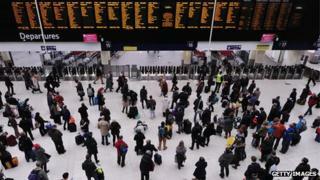 Most train passengers are unaware of their rights to compensation after cancellations or delays, the rail regulator has said. As many as 75% of those using Britain's railways do not know enough about claiming money back, said the study for the Office of Rail Regulation (ORR). For example, passengers choosing not to travel after a delay or cancellation are entitled to a full refund. In response, the industry admitted that more needed to be done. In addition to being unaware of their rights, the study found that 74% of passengers thought train operators did not do enough to inform people about how to claim compensation. Some passengers said such information should be displayed more prominently on websites or posters. "We want to see that passengers are treated fairly, receive the quality of service they pay for, and when this is not the case, can hold their service providers to account," said Anna Walker, the chairperson of the ORR. But the industry defended its record. "Compensation has become increasingly generous and easier to apply for in recent years," said Michael Roberts, the director general of the Rail Delivery Group (RDG). He said the amount of money paid out in compensation to passengers for train delays rose by £3m in one year alone, and that punctuality was improving. In 2012-13, the RDG said more than 90% of trains arrived on time. But it admitted that more could be done to help passengers know their rights. Among them is the right to claim a refund when a train is cancelled or delayed. If you decide not to travel in such circumstances, you are entitled to all your money back. If you decide to go ahead with the journey, and the train arrives late, you are still entitled to compensation. Each operator sets its own rates, but passengers arriving one hour late are entitled to a minimum 20% rebate. Earlier this week, the consumer group Which? found that customer satisfaction with Britain's train network was "shockingly low". The survey of 7,000 passengers found that 11 of the 19 train companies it investigated had customer satisfaction rates of less than 50%. The poorest operators were Greater Anglia and Southeastern, both of which scored just 40%. The best operator was Merseyrail. The ORR said that later this year, it would introduce a new code of practice on ticket information. The code will clarify information about fares and restrictions, as well as compensation and refund rights. The Association of Train Operating Companies (ATOC) has also developed a "toolkit" to help train companies make passengers more aware of how they can claim compensation. At the moment, each train operator also publishes its own separate customer charter. Train service satisfaction shockingly low, says Which?